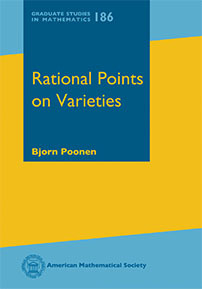 This book is motivated by the problem of determining the set of rational points on a variety, but its true goal is to equip readers with a broad range of tools essential for current research in algebraic geometry and number theory. The book is unconventional in that it provides concise accounts of many topics instead of a comprehensive account of just one—this is intentionally designed to bring readers up to speed rapidly. Among the topics included are Brauer groups, faithfully flat descent, algebraic groups, torsors, étale and fppf cohomology, the Weil conjectures, and the Brauer-Manin and descent obstructions. A final chapter applies all these to study the arithmetic of surfaces. The down-to-earth explanations and the over 100 exercises make the book suitable for use as a graduate-level textbook, but even experts will appreciate having a single source covering many aspects of geometry over an unrestricted ground field and containing some material that cannot be found elsewhere. Graduate students and researchers interested in arithmetic geometry. The reviewer cannot emphasize enough how brilliant and necessary this book is. It will be a great reference text for researchers and essential reading for graduate students in arithmetic geometry for many years to come. I will certainly be recommending that all my Ph.D. students study it in great detail. A monograph/textbook whose main goals are to introduce the interested reader to the methods and problems of arithmetic geometry and at the same time discuss open problems of interest for further research is therefore a most welcome addition to a classical subject..The choice of topics and the decisions on what to spell out and what to just barely sketch, with adequate pointers to the existing literature, make the book under review an excellent quick introduction and reference on this subject..The book is well structured, balancing explicit constructions, terse arguments, and precise references to the literature when needed. The origins of arithmetic (or Diophantine) geometry can be traced back to antiquity, and it remains a lively and wide research domain up to our days. The book by Bjorn Poonen, a leading expert in the field, opens doors to this vast field for many readers with different experiences and backgrounds. It leads through various algebraic geometric constructions towards its central subject: obstructions to existence of rational points. It is clear that my mathematical life would have been very different if a book like this had been around at the time I was a student. Understanding rational points on arbitrary algebraic varieties is the ultimate challenge. We have conjectures but few results. Poonen's book, with its mixture of basic constructions and openings into current research, will attract new generations to the Queen of Mathematics. A beautiful subject, handled by a master.